Institute captain Stephen O'Donnell scored twice at Annagh United. This certainly was two points dropped for Institute, as bottom side Annagh United battled hard for a share of the spoils. Centre-back Stephen O’Donnell did all he could to win the points for the Waterside men as he came up from the back to score twice, but two defensive mistakes cost them dear and worryingly for boss Kevin Deery his side lacked leaders, composure and know how to win a game. Also alarmingly for Deery at Tandragee Road, was that not for the first time this campaign, his team lacked that little cutting edge and were toothless at times in the final third. 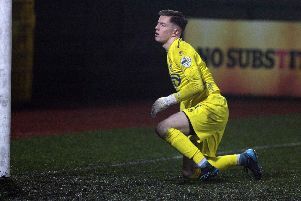 Institute missed a glorious chance to take the lead after just two minutes when Gareth Brown broke the Annagh offside trap, but United keeper Eoin Hughes did well to deny the striker. Bottom side Annagh were happy to let Stute have a lot of possession in the first half, but on too many occasions they attempted ‘quarter-back’ like passes and those long balls were either over hit or the United back-line dealt with them. Aaron Harkin, Sean McCarron and Sean Roddy all went close with long range strikes, but in truth after Brown’s early strike United keeper Hughes wasn’t really troubled in the opening 45 minutes. Incredibly the home side took the lead on 52 minutes in comical circumstances as Darryl McDermott’s back pass went behind Marty Gallagher and despite racing back the keeper couldn’t keep the ball out of the net. The Drumahoe side made a triple substitution virtually straight away with Ryan Morrow, Gareth McFadden and Alex Pomeroy replacing Sean Roddy, Mark Scoltock and McCarrron and the changes worked as Stute levelled things on 67 minutes. Aaron Harkin’s free-kick from 20 yards was only parried away by Hughes and the alert O’Donnell was on hand to turn home the loose ball. With their tails up Kevin Deery’s side took the lead on 73 minutes when that man O’Donnell, up from the back was on hand to turn the ball home from 20 yards, after Hughes had initially raced out to deny Pomeroy. Incredibly the home side levelled things on 87 minutes after another stupid mistake by the visitors. Substitute Morrow brought down Craig James Taylor close to the left hand touch-line and Jake Richardson’s resulting free-kick went straight the way through and found Gallagher’s bottom left hand corner, to spark wild celebrations amongst the home side’s players. Annagh United: Hughes, Richardson, Stewart, White, Murphy, Whitten, Webb, Park, Gardiner, Eagle, Taylor. Institute: Gallagher, O’Donnell, Scoltock (McFadden 55), McDermott; Roddy (Morrow 55), C Harkin, A Harkin, Doherty, Brown; McCarron (Pomeroy 55), McIntyre.